If anyone regularly circumambulates the Lord in the form of Sonacala, he has no rebirth. He shall certainly attain eternity. If a person takes even a step by way of circumambulation, the entire earth is sanctified by coming into contact with the dust of his feet. With palms joined in reverence he should make obeisance in every direction. He should then meditate and eulogize. He should circumambulate slowly without his hand touching anyone else. Without any agitation, without even hearing the sound of his own steps, the devotee should circumambulate in the manner of a woman walks when delivery is imminent. The learned devotee should put on a clean dress after bath. He should apply sacred ash over his body and adorn himself with rudraksa beads. Remembering Siva he should take steps slowly. He should think about the likelihood of collision with thousands of Devas, invisible Siddhas and others of gaseous forms. He should be a true devotee and go ahead slowly putting down his steps along the path. Or the devotee should circumambulate along with other devotees chanting the names of Siva, singing excellent songs and dancing like Siva. Or he should, with his mind not dwelling on anything else, listen respectfully to my greatness and circumambulate slowly feeling the thrill of the bliss. He must offer different kinds of charitable gifts. He must perform meritorious deeds. He should render assistance to supplicants. He should be pious and merciful in a manner he thinks best. Thus he should move around. In Krtayuga the Linga is fiery. In Treta it is a jewel mountain. In Dwapara one should think about it as golden and in Kaliyuga it is an emerald mountain. Or he can meditate upon the red crystalline form that is self-luminous. Meditating thus, he will be freed from all sins. He shall go to the city of Siva. This Linga with the name of Arunachala is the greatest on account of its inscrutability resulting from its state of not being an object of speech and mind and also because of its fiery nature. It is unapproachable. But I become approachable immediately to the person who circumambulates after meditation. Lord Shiva is known as Chandrasekhara, which literally refers to the 'Person who wears the moon' and ‘one crowned by the moon’. The crescent on the Lord’s head represents the fifth-day moon and near his fiery third eye this shows the power of Soma, the sacrificial offering, which is the representative of Moon and signifies that Shiva possesses the power of procreation co-existent with that of destruction. In some cultures the appearance of the new crescent moon has been celebrated as a return of the moon from the dead. This celestial body is a powerful influence on the human psyche. Its influence which is always available at Arunachala is celebrated in disparate ways during Sivaratri and Poornima. Sivaratri is the fourteenth day of the lunar fortnight, when the moon is waning and the sun is in the sign of Aquarius. It is a night of consecration and illumination. Each month there is Sivaratri and once a year Mahasivaratri. Chandra, who is the deity of the moon and presiding deity of the mind loses one sixteenth of his brilliance every day after the full-moon day and continues waning until, by Sivaratri, he is left with just one sixteenth of his power. It is on this night of the waned moon (Sivaratri) that it is believed the mind is most tractable and can be easily conquered. Whereas the nights of Siva (Sivaratri) are usually associated with mastery of the mind and success of spiritual ambitions, Poornima (full moon) is more about success of boons, vratas and heartfelt prayers. Doing pradakshina on Monday, (the day of the Moon -- Chandra) is particularly helpful if one wishes to start a new project, attain a high elevation in life or rid oneself of the fear of death. In Sanskrit Chandra means, 'bright and shining'. In Vedic Astrology, Chandra represents brain and mind, emotions, sensitivity, softness, imagination, Queen and mother. The bright moon is considered a benefic, and for this reason answers to prayers connected with the Poornima (full-moon) aspect, are believed to be more easily attained. Chandra one of the navagrahas (celestial bodies of cosmic influence) is the lunar deity also identified with the Lunar deity Soma, and faces the South-East direction. This graha causes nightfall, strengthens the mind, purifies the blood and is considered as the Mother who radiates nectar. Worship of the Moon is said to be beneficial for relief from all sorrows and helps in curing mental afflictions. The Moon's cool rays radiate happiness. Worshipping Chandra on Mondays is said to be very effective in getting one's prayers answered. Chandra is described as young, beautiful, fair; two-armed and having in his hands a club and a lotus. He rides his chariot across the sky every night, pulled by ten white horses or an antelope. He is connected with dew, and as such, is one of the gods of fertility. He is also called Nishapati (Lord of the Night) and Kshuparaka (one who illuminates the night). The Moon is known as a hare, or rabbit in Vedic lore, as he jumps faster than any of the other grahas. The Moon rules over the sidereal sign of Cancer. He is exalted in Taurus, and fallen in the opposite sign of Scorpio. Chandra is a lovable God; pleasing to children as well as elders. Sages and devotees invoke the Goddess in Chandra. Hinduism propounds the idea that the (nine) Navagrahas (of which Chandra is one) are 'markers of influence' -- living energies which put out waves which affect our awareness by seizing our consciousness when we come under their influence. Reports of psychics and seers agree that Grahas cause a direct energy influence upon the energy bodies and minds of all life on earth. The nine planets (Navagrahas) are transmitters of Universal, archetypal energy and the qualities of each planet helps maintain the overall balance of polarities in the solar system. In one legend, Chandra is considered the son of the ocean as he was one of the fourteen ratnas (Jewels) that emerged from the ocean during its churning and was gifted, by the Gods and Demons to Lord Shiva, who wore the crescent moon on his head. Chandra has the following associations: the colour white, gender female, metal silver, gemstones; pearl and moonstone, element water, direction north-west, season Winter, body part blood, food rice, taste salt, day Monday, guna Sattwa. The sun is the indicator of the soul and the moon is the vehicle of the mind that receives the light of the soul. Even though all the Navagrahas are represented at Arunachala, the moon with its particular association with Lord Shiva (Chandrasekhara) has an extraordinary influence. A benefic Moon is often found in the charts of doctors, healers or psychologists, as well as good mothers and wives. A strong Moon can give power and creates a good administrator or leader open to the needs of his people and indicates relationship, interchange, and communication. A strong Moon also shows sensitivity, receptivity, caring for others and a nurturing attitude in life. It gives emotional maturity, responsibility and the capacity to have a beneficial effect upon society. One day Sun, Moon, and Wind went out to dine with their uncle and aunts Thunder and Lightning. Their mother (one of the most distant Stars you see far up in the sky) waited alone for her children's return. Now both Sun and Wind were greedy and selfish. They enjoyed the great feast that had been prepared for them, without a thought of saving any of it to take home to their mother—but the gentle Moon did not forget her. Of every dainty dish that was brought round, she placed a small portion under one of her beautiful long finger-nails, that Star might also have a share in the treat. On their return their mother, who had kept watch for them all night long with her little bright eye, said, "Well, children, what have you brought home for me?" Then Sun (who was eldest) said, "I have brought nothing home for you. I went out to enjoy myself with my friends—not to fetch a dinner for my mother!" And Wind said, "Neither have I brought anything home for you, mother. You could hardly expect me to bring a collection of good things for you, when I merely went out for my own pleasure." But Moon said, "Mother, fetch a plate, see what I have brought you." And shaking her hands she showered down such a choice dinner as never was seen before. Then Star turned to Sun and spoke thus, "Because you went out to amuse yourself with your friends, and feasted and enjoyed yourself, without any thought of your mother at home—you shall be cursed. Henceforth, your rays shall ever be hot and scorching, and shall burn all that they touch. And men shall hate you, and cover their heads when you appear." And that is why the Sun is so hot to this day. Then she turned to Wind and said, "You also who forgot your mother in the midst of your selfish pleasures—hear your doom. You shall always blow in the hot dry weather, and shall parch and shrivel all living things. And men shall detest and avoid you from this very time." And that is why the Wind in the hot weather is still so disagreeable. But to Moon she said, "Daughter, because you remembered your Mother, and kept for her a share in your own enjoyment, from henceforth, you shall be ever cool, and calm, and bright. No noxious glare shall accompany your pure rays, and men shall always call you 'blessed.'" And that is why the Moon's light is so soft, and cool, and beautiful even to this day. To check online 'live status' for Tiruvannamalai trains, go to this Indian Railways link and register as a member. 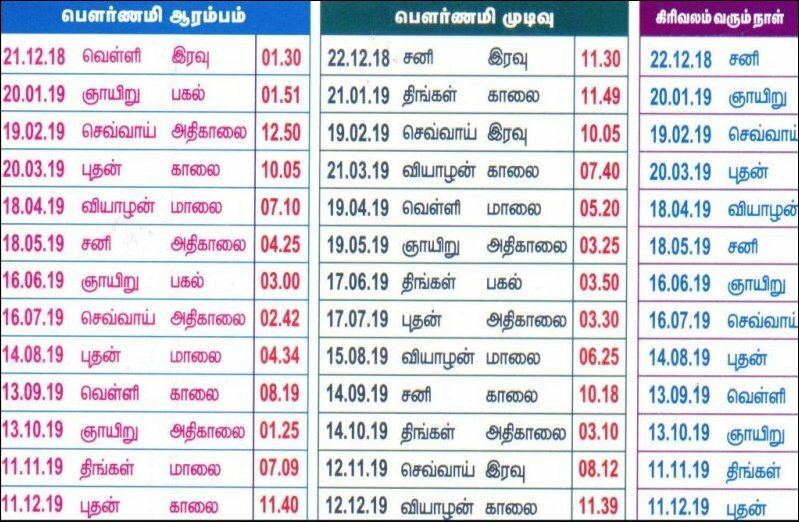 Once registered login for 'live status' updates of Tiruvannamalai trains. The below is a recent 'live status' sample for Tiruvannamalai train arrivals and departures. The moon's gravitational pull on the Earth is the main cause of the rise and fall of ocean tides. The moon's gravitational pull causes two bulges of water on the Earth's oceans—one where ocean waters face the moon and the pull is strongest and one where ocean waters face away from the moon and the pull is weakest. Both bulges cause high tides. As the Earth rotates, the bulges move around it, one always facing the moon, the other directly opposite. The combined forces of gravity, the Earth's rotation, and other factors usually cause two high tides and two low tides each day.